At the end of this song EACH.AND.EVERY.TIME the kiddos say VERY matter of factly… “Ender is not a real word”. I have my Kinder teacher bestie-friend to thank for this. Several of my kiddos learned it in her class last year. Now they’ve taught the rest of my kiddos. They love it, and repeat it. Constantly. Incessantly. Whenever they can. Whenever they feel it is appropriate. Which is pretty much whenever anyone mentions a month. So, it’s a given that I hear it at calendar time. That’s at the beginning of the day people. Then it is playing over and over again in my head for far too many hours. And, if they are feeling especially silly…. they sing it all.day.long. It also may have something to do with the fact that they usually crack me up with it. I haven’t always been a fan of calendar time. Mine has definitely gone through a lot of tweaking over the years. For me it has to be quick, effective, and helpful. The stuff on the bottom is where we focus each morning. The ten frames represent the date… 25th here. This part is helpful in figuring out coins. Each ten frame = 1 dime. A row of dots by itself = 1 nickel. 1-4 dots = 1 penny each. 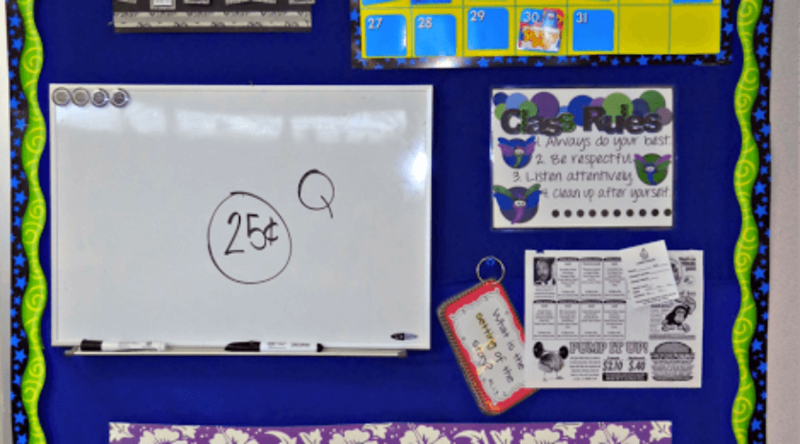 When we get to where we did today… two and a half 10 frames we have a quarter/25 cents. Practicing coins this way has been SUPER helpful. 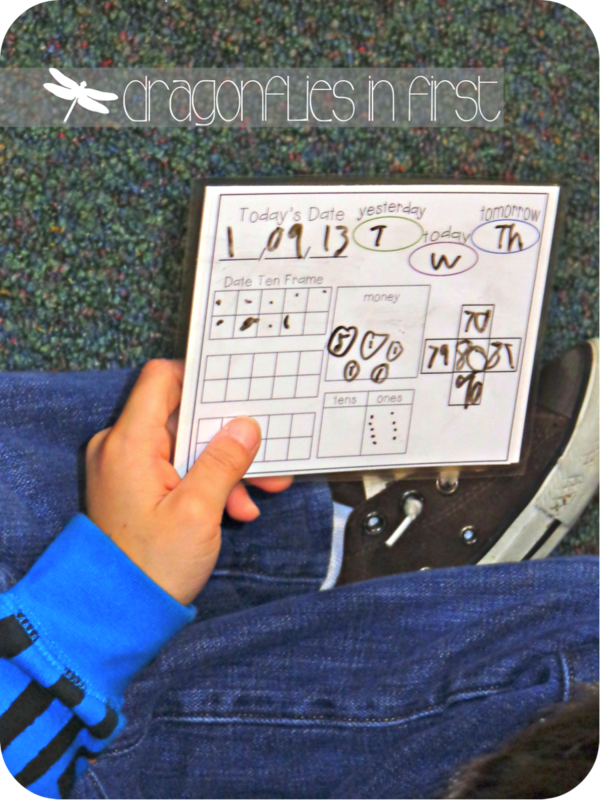 We also use the date to practice tens and ones. The ten more and ten less grid is centered around how many days in school. 91 today! Halfway done with the year. Wow! The days of the week is self explanatory. After I added the black circles to the yellow background and laminated it, I added those self-sticking removable hooks to hold the day cards for yesterday, today and tomorrow. I just have little holes punched into the day cards. At the beginning of the year, I complete this board. Modeling each step. Talking about my thought process out loud. After a couple weeks, I call on random kids to do the various parts. We discuss what’s right, wrong and confusing. Then we progress into all of the kiddos doing it on their own each day. When the kids come in each morning they grab a pen and a card. 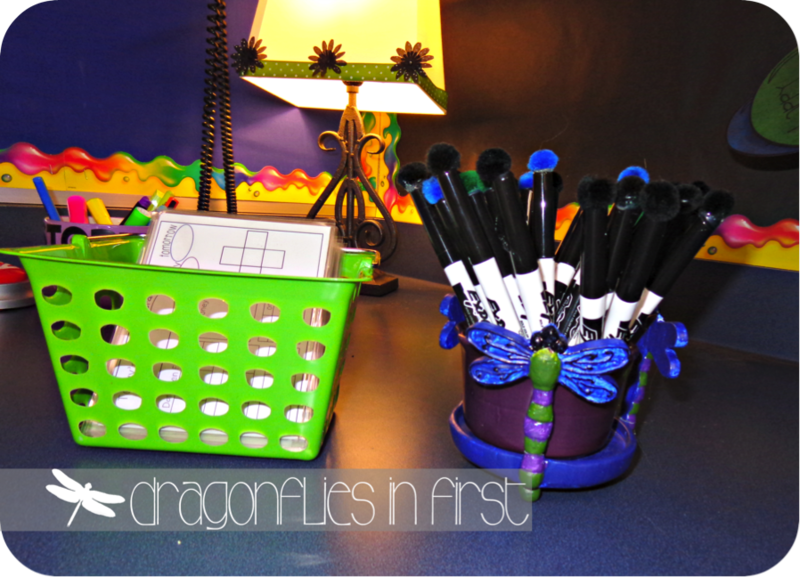 I use thin dry erase markers with little pom poms hot glued to the caps. The pom poms serve as erasers. THANK YOU Pinterest for this idea – wish I could give credit to the original pin/pinner – but I found it on an untraceable upload. The cards are a piece of paper glued to a thin piece of cardboard (thicker than cardstock) and then laminated. It’s our morning routine to come in, grab the pen and card and sit on the rug area in front of the calendar board. They get to work immediately filling in all the info. This is so simple. It’s been very effective. The kids enjoy it. It is totally quiet while they are all engaged. 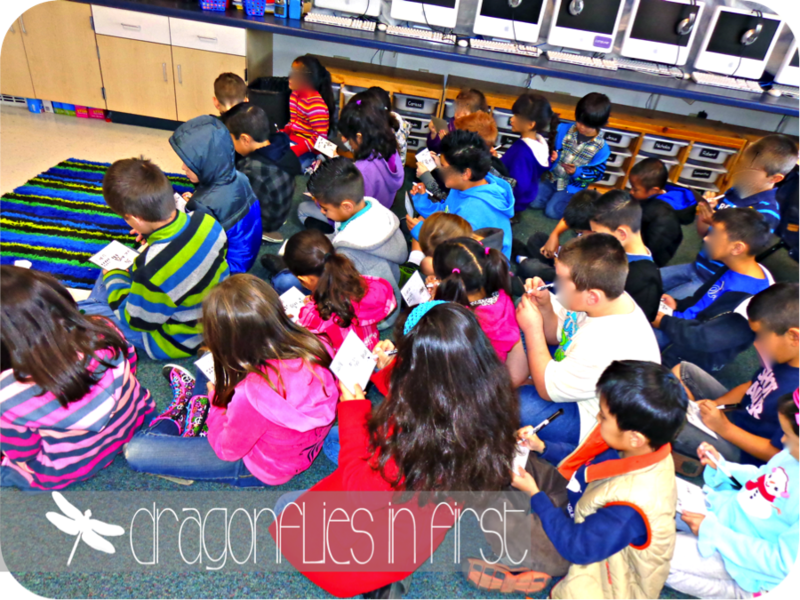 I am able to take attendance and lunch count while they are filling in their cards. All of the kids get to practice each and every day instead of just a handful that get called upon. They erase each part as we go over the answers together and I put the correct answers on the board. 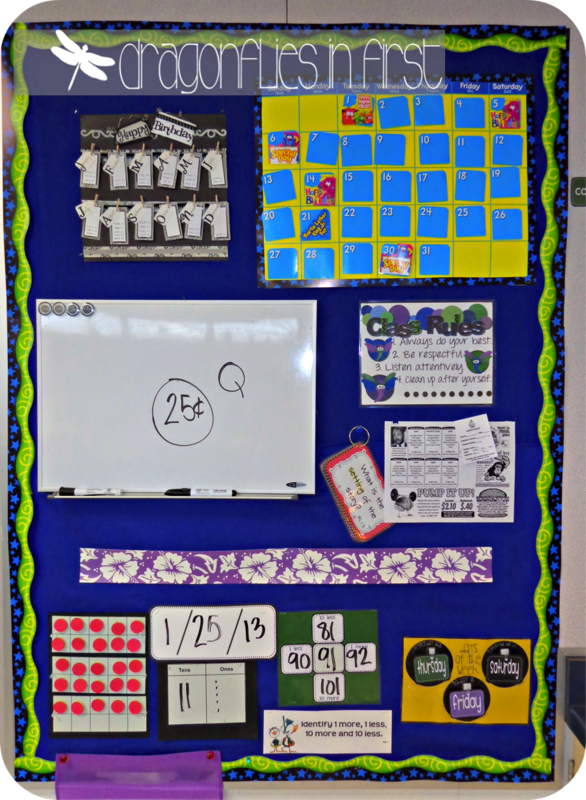 By the time we are done, the boards are clean, caps are already back on the pens and we’ve practiced 5 different math standards in just a few minutes. Click the pic below to grab a copy of all my calendar math makings. Like this a lot. Really user friendly. Thank you! Nice and clear. I love your mini boards. I have a resource room and I don't do calendar work a lot – justify it with the fact that they often do it in their classrooms. This would be a great way to reinforce math skills that I do need while reinforcing the calendar work. Thanks! Oh my gosh….have you ever had a moment where you saw something and it just made you giddy because you can't wait to use it because you know it will just change things in a really, really big and meaningful way!??!?!?!?!?!?!?! We do Bridges math and Number Corner is our "calendar time". I struggle with keeping the kids engaged because doing it every day makes them tune out…and only a handful actually raise their hands to participate. I'm always saying to myself…I know we do this every day, and I know I THINK they should be able to do everything here…but c'mon you know half of them are tuning you out – that's why they STILL don't understand 10 more, 10 less…"
THIS is going to solve my problems!!!!! So where did you get the cardboard? Wow…your a teacher genius! Thanks for sharing! THANK YOU for sharing! My school uses Every Day Counts throughout all grades Pre-K thru 6th and it incorporates many of the activities you have BUT like Holly stated the kids are bored and uninterested and frankly so am I. I usually rush through it, sort of like taking off a bandaid 🙂 I really love the calendar card that each child gets to fill out, this way all kids are actively participating during calendar time and not just sitting there listening to someone else answer. They all can check to see if their answer is correct and like you stated we are covering so many standard at the same time. I cannot wait to use it on Monday with the kids, I am sure they will all be excited, especially since they get to use a dry erase marker. I am already excited just thinking about it and will definitely share it with my grade level. I LOVE the colors in your calendar!!!!!! MUY BUENO!!!!!! This calendar math is wonderful! Thank you for sharing. I am excited to make this fit into my classroom! HA! Now I can't get that song out of my head! I was looking for a song and can't wait to share it with my Firsties. Also love the idea of each kid having an active part during calendar time. Can't wait to use your idea to supplement what we already have. Thanks so much for sharing! That song is so adorable!! I love that your kiddos correct it. So funny. What a fantastic idea for your morning routine! One of the things that bugs me about calendar is that I always think it lacks engagement. This is a perfect solution for that! I didn't see the pom pom Pinterest markers, but shoot! I wish I had – great find and idea! I Love, Love, Love this…. 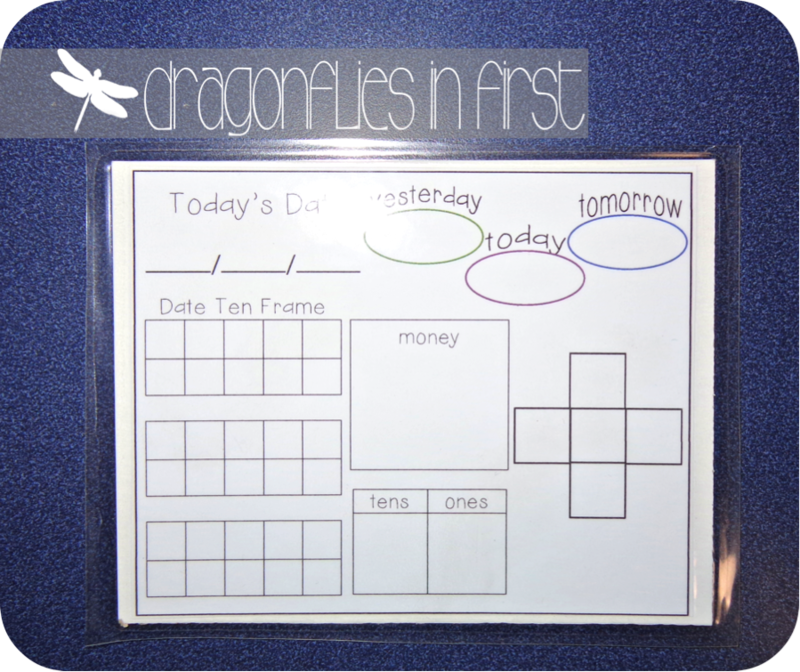 I teach first (& second) grade in Ontario and am obsessed with Dragonflies (and with doing a better job with teaching math) so this blog was all kinds of perfect rolled into one for me…. much thanks for sharing!!!!! OMG!!! I have been searching for the right first grade calendar ideas. This will be my first year teaching first grade after kindergarten and pre-k for 20 years. This helps me out so much!! Thanks again!! Traci – I just saw this post for the first time and I'm dying here!!! This is seriously just what I was looking for… You rock friend. I love this!!!! Okay, I just saw this now (how did I miss it?) thanks to Vicky. I may have to do this. Thanks for sharing, Traci! This is awesome. Just what I needed. Thank you!! I used most of these on my calendar board this past year and it really made a difference. I was wondering if page 8 could be edited? Instead of half page, whole page. I teach K and they have a tendency to write a little larger. Also, where did you find your cute class rules chart?? My email account from above is no longer active. It is now [email protected] I need to figure out how to change it. Thanks. I think your calendar is great and I love the cards that each student fills out. Thanks! I love it and use most of these activities but not on individual boards. Thanks for sharing! How do you expand the 10 frame section for the kids boards and your boards when numbers get higher for the day of school such as 98, for instance? Do you use garage sale dots? Hi Molly! We use the ten frame for the days of the month, so it doesn't get higher than 31. They write on their "boards" with dry erase marker and draw the dots. 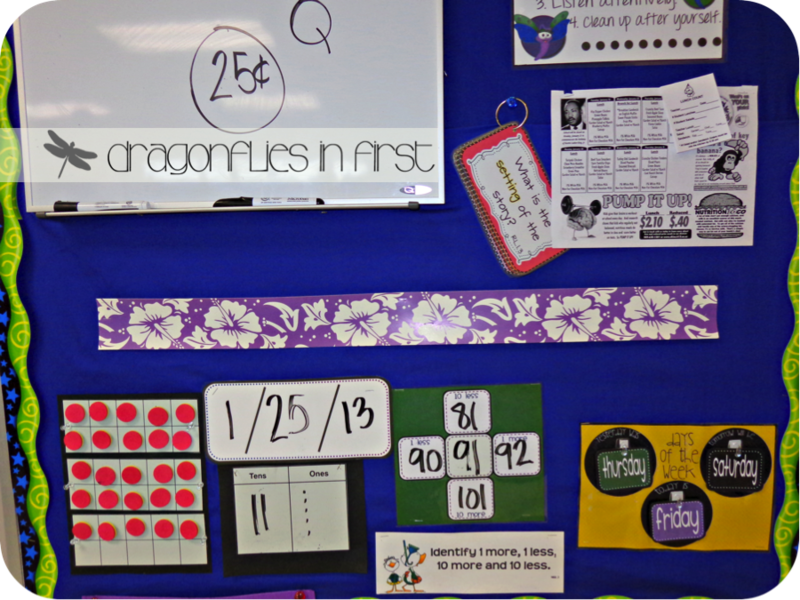 I use the little foam dots that came with our math curriculum and stick them to the 10 frame on the wall using tacky putty.